The end of the school year is a time of anticipation and excitement. Graduating seniors are busy enjoying their last few weeks on campus, lining up graduate school plans or beginning their job search, eager to discover what the future has in store for them. 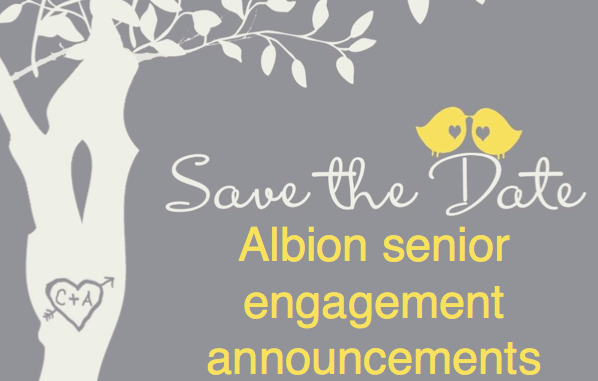 On top of all that excitement though, a few Albion students, like Samantha Staneck,Pickney senior, and Samantha Bowditch, Portage senior, are celebrating recent engagements and planning their weddings. Featured below, both share their engagement stories. Samantha Staneck, Pickney senior, is engaged to Patrick Underwood, an Albion alumnus who received is bachelor’s degree in biochemistry in 2012. The two met through mutual friends in 2003 and have been together ever since. On Pat and Sam’s nine-year anniversary, Pat took Sam to the Zukey Lake Tavern for a celebratory dinner. After dinner, Pat took Sam down by the water to the place where they had first met, got down on one knee and asked Sam to marry her. Sam, of course, said yes. The wedding is planned for July 19, 2013. After graduation, Sam will be attending a Doctor of Physical Therapy program at University of Michigan – Flint, and Pat will continue to attend medical school at University of Michigan. Samantha Bowditch, Portage senior, is engaged to Justin Breithaupt, a Schoolcraft native and graduate of the University of Michigan. Sam and Justin met in February of 2007 at a Fellowship of Christian Athletes lock-in held at Schoolcraft High School. Live bands were playing music when, suddenly, Justin walked up to Sam and asked her to dance. Sam said yes, and they started dating a few weeks later. On March 22, Sam and Justin’s six year anniversary, Justin took Sam to dinner at the Fieldstone Grill, where he arranged for both of their families to be waiting for them at their table. Once Sam saw everyone all together with teary eyes and video cameras, Justin took her hand, got down on his knee and asked her to marry him. Sam said yes, and the wedding is planned for August of 2013. After graduation, Sam plans to teach Spanish and/or math at the high school level, and Justin will continue studying at Cooley Law School.